We interrupt your day to bring you perhaps the most depressing moment in anime history. Her name was Nina Tucker, and Fullmetal Alchemist destroyed her and it made me cry. Shou Tucker, Nina’s father, was a kindhearted alchemist who famously gave speech to a chimera, an unholy creature brought to life by alchemically combining two living animals. 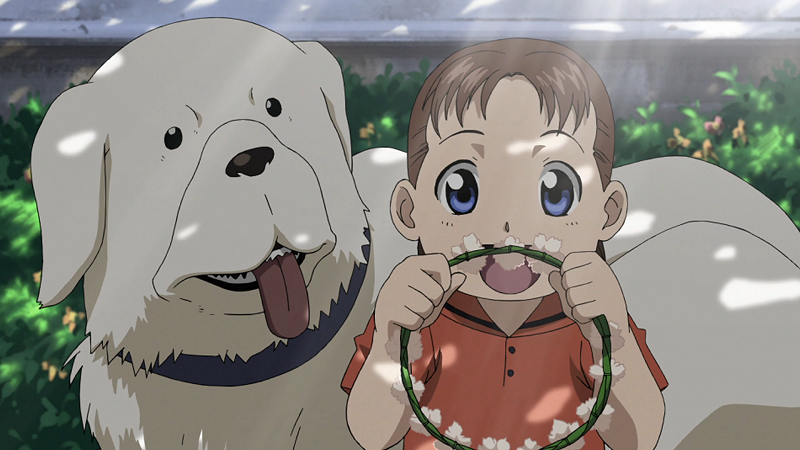 Fullmetal Alchemist’s (and its 2009 version Brotherhood’s) protagonists, Edward and Alphonse Elric, lost their bodies as children attempting to bring their mother back to life with novice alchemy. Shou Tucker, they thought, could help restore their full human forms. They paid a visit to his house, where he lived with his four-year-old daughter and friendly big dog, Alexander. Shou Tucker’s wife, his daughter believed, went to live at her parents’ house two years ago. Tucker’s experiments immersed him. Much of the time, his daughter was left alone to play with her dog. After Nina’s mother passed, she confided in the Elrics, her father cast away all other pursuits and dedicated himself to his alchemical studies. In fact, his position as a State Alchemist was in jeopardy—if he didn’t do some impressive research soon, his job and reputation were at stake. While he worked, Edward, Alphonse, Nina and Alexander while away time together, playing and laughing. Laughing. Laughing. One day, close to her father’s research deadline, Nina tries to alleviate his anxiety. She tries to tell him that she loves him and it will be okay. That’s when he gets an idea that is so fucked up on so many levels that I still cannot hear the words “big brother” without choking back tears. Soon after, Shou Tucker reveals to Edward and Alphonse his recent breakthrough: a canine beast with dead, white eyes and brown, long hair. “I made it just in time for the assessment. Now I won’t have to worry about my research funds,” Tucker says. “Ed... brother..,” she says. Edward balks. He asks when the last time he’d transmuted a chimera. It was two years ago, around when Tucker’s wife died. Fullmetal Alchemist: Brotherhood left Netflix last July. Yesterday, it was added to Crunchyroll. Go ahead. Watch one of the most upsetting and horrifying moments in all of anime and tell me how you managed to go on in the comments.